Tin Whistle Sheet Music Notes For Irish Folk Songs Page Two. 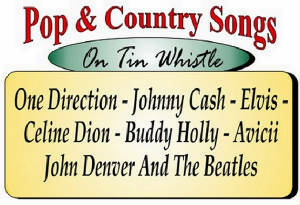 If your just beginning to learn how to play the whistle pick a few easy one to start with before moving on. Some of the easy tunes would be Sean South, Red Viver Valley and Red Is The Rose along the must popular tune of them all Boolavogue. There are a few that don't have the whistle ''holes'' but just the sheet music. By the time you get the few easy one off you'll soon figure out how to read standard notes. 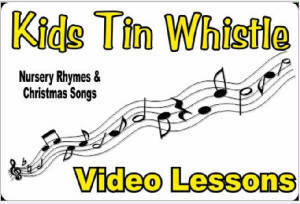 I have started to included video tuition for some of the tunes, look out for the word video beside the link. James Yorkston/ Dubliners + video lesson. Includes banjo tab. Wolfe Tones - Same tune as ''Drunken Sailor'' Video lesson included. Pat Cooksey / Furey Bros.
James Kerrigan + video lesson. Brave Tom Williams is also included. Letter Notes Only, + video lesson. 13 century. It was made of bird bone. and had keys and not holes as today. Feadóg. Most are actually made of brass and not tin. is because it's taught in primary schools in Ireland. because it's a very inexpensive way to learn music. You can purchase a tin whistle for €5.00 for starting off with. produce the widest range of whistles in different keys. that produce different tones by changing the bore. very popular at sessions in Ireland. holes that a player can play the chromatic scale. that's very similar to playing the flute. in traditional music but also in jazz and classical music. were used outside trad. music. and No. 2 albums in the U.K. charts at the same time. Many of the tracks on their albums include tin whistle. the tin whistle was used on a whole album. Vincent Broderick who was born 1920 in Loughrea Co. Galway. and composed almost 100 tunes. Peter Browne, a Dubliner born in '53 plays uilliann pipes and whistles. Island'' was recorded by Sharon Shannon. Vincent works for R.T.E. including one on Seamus Ennis. Willie Clancy learned how to play the whistle at the age of 5. Johnny Keenan learned to play music from a very early age. played many instruments he was more know as a banjo player. who done a rake of gigs in Slattery's Pub on Caple St Dublin. many's a good day drinking and singing myself. 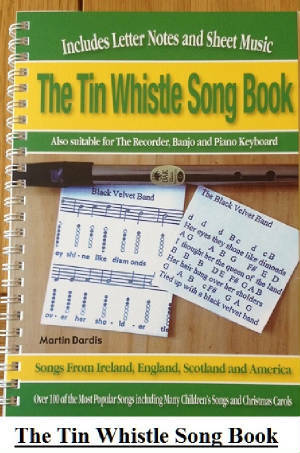 Below is an example of the sheet music used for playing the tin whistle. You'll notice it's different than standard sheet notes. Each note has an image of what notes to keep your fingers over while playing. The black holes is where to place your fingers and the clear parts are not to be covered. The + symble means you will have to blow a bit harder to get the higher note in the second octave. A sharp # symble means that the note is too low for the chosen whistle. There are no half covered holes used on the sheet music on this site but you may find them on other sheets for whistle.